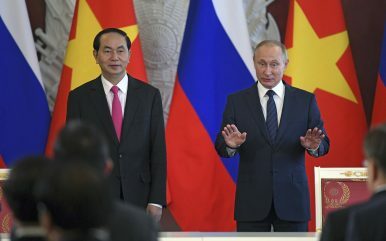 Russian President Vladimir Putin, right, and Vietnamese President Tran Dai Quang attend a news conference following their meeting in the Kremlin in Moscow, Russia Thursday, June 29, 2017. Rosneft is a crucial arm of Russian foreign policy, yet functions at times without direct Kremlin involvement. China has been the driving force behind Russia’s “Pivot to Asia,” becoming the largest individual consumer of Russian oil among its energy trade partners. Early this month, it was reported that Russia had completed the delivery of its first S-400 regiment – the country’s most advanced air defense system for export – to China. Beijing’s Ministry of Commerce is signaling that trade turnover with Russia may reach $100 billion this year Russia and that investment under the aegis of the Belt and Road Initiative (BRI) is growing fastest in percentage terms in Russia. Trade is up because oil prices are up, not necessarily because of an economic breakthrough, but the messaging is part of a broader commitment to making it appear as though all is well between the two countries. Two recent developments mark a significant change in the relationship. First, CEFC China Energy walked away from a deal to acquire 14.16 percent of Rosneft’s shares. Mired in scandal, the company has come under heavy scrutiny about its international expansion at home. Qatar stepped in to buy the shares instead as Rosneft changed its corporate strategy to provide better returns for shareholders and entice Qatar. Then China’s Ministry of Foreign Affairs issued a warning over Rosneft’s drilling activities in the 06.01 natural gas block, a project of which it owns 35 percent and is an operator. Cooperation with PetroVietnam for offshore projects is drawing Beijing’s ire as the block falls within China’s Nine-Dash Line claims in the South China Sea. The latter points to growing tensions within Russia’s Asia pivot. Rosneft is a crucial arm of Russian foreign policy, yet functions at times beyond the remit of the state. When asked about China’s warning, Kremlin press secretary Dmitry Peskov stated, “as far as we know, the company has already made a statement that it works exactly in line with the obtained licenses.” Rosneft and Russian gas giant Gazprom both have projects in contested offshore waters with Vietnam, but the Kremlin can’t come out publicly supporting Rosneft’s claims that block 06.01 lies within Vietnam’s territorial waters. Doing so would tacitly take sides regarding China and Vietnam’s competing maritime territorial claims. For Rosneft CEO Igor Sechin, Western sanctions on offshore equipment and Arctic oil and gas exploration are a serious problem. Exxon has walked away from Arctic exploration projects that at one time were expected to result in as much as $500 billion worth of investments. Rosneft has managed to replace Western imports for offshore and open-sea oil platforms for its projects on Sakhalin Island, but has costs are high and quality is low. Tokyo is interested in developing Vietnam’s reserves, evidenced by Japan Drilling Co. Ltd.’s role carrying out drilling work at two of the three gas fields in question. These projects are a means for Rosneft to gain more expertise in managing offshore projects by partnering with Japanese firms otherwise stuck by political disagreements between Japan and Russia over territorial claims and pressure from the United States. That’s particularly important at a time when major Western partners are reticent to enter joint ventures outside of existing cooperation on Sakhalin Island. Rosneft is a crucial arm of Russian foreign policy, yet functions at times without direct Kremlin involvement. It’s likely that the deal in Vietnam was a lower-order priority for Putin’s team. The find is relatively small and the new government has just been announced. Domestic politics have taken priority in recent months and the U.S. withdrawal from the JCPOA regarding Iran has surely taken up considerable policy bandwidth. Generally, Russia has striven to maintain the appearance of neutrality over territorial disputes in the South China Sea. Moscow has supported Beijing’s desire to keep the U.S. out of any regional resolution, but has stopped short of endorsing China’s Nine-Dash line claims. Despite growing naval cooperation with China – joint exercises in September of 2016 in the South China Sea were held – both sides consciously opted to avoid holding them in contested waters. China is far and away Russia’s most important partner in the region, but the risk of over dependence is a constant concern for Russian policymakers. The Kremlin’s statement serves an important function in that it insulates Putin from Rosneft’s decision at a time when it’s become readily apparent that the political side of the economic relationship with China is changing somewhat. The cancellation of the CEFC China Energy deal marked a growing sense in China that Russia is not a safe investment for big ticket items. Rosneft’s corporate strategy has generally combined a healthy appetite for raiding assets in Russia, pushing through heavily politicized deals abroad with geopolitical implications, and a reliance on debt. China National Petroleum Corporation (CNPC) was hoping that a combined $70 billion in prepayments back in 2013 would net it oil assets in Russia. It didn’t. CEFC China Energy was Rosneft’s bridge to more deals in China, a nominally privately-owned firm with its own transparently political agenda in its acquisitions abroad. Without it, Rosneft has no particularly willing corporate partner in China. It’s quite likely that CNPC will drag its feet for further talks over refinery projects as it courts money from Saudi Arabia’s Saudi Aramco instead. Pursuing relationships with countries other than China is central to the realization of the “Pivot to Asia.” The aggressive energy politicking of Russia’s premier oil giant has left it reliant on the Chinese market, creating the possibility of a Beijing veto on sensitive projects in the South China Sea important to the company’s strategy. Russia’s support for the Democratic People’s Republic of Korea (DPRK) has also rendered attempts to deepen energy ties with Japan and South Korea largely fruitless. It’s only on the periphery in places like Vietnam where cooperation can take place for offshore projects in the current sanctions environment. Russia’s China policy lacks a coherent institutional center, relying on personalities. Igor Sechin has functionally taken the lead in dealing with China and his business overtures reflect the personalist impulse towards policymaking. Now-arrested CEFC head Ye Jianming had built up his company with aggressive deals abroad amidst a clamp down on “irrational investments” among China’s major enterprises to cut down capital flight. But Ye fell to the centralization of power within President Xi Jinping’s “power vertical,” and the lack of an institutional approach has left Rosneft – and Russia – out in the cold. Sechin never had a great deal of political capital in China after burning CNPC after 2013, but his approach and the lack of interest in building meaningful policy institutions in Moscow have damaged Russia’s relationship with China. That problem is compounded by competing interests in Vietnam skirting an issue integral to China’s national strategy and identity. China’s statement rebuking Rosneft claimed “any state, any organization, any company or individual cannot, without obtaining permission from Chinese authorities, carry out exploration activity in the maritime area under China’s sovereignty.” Sovereignty is one of Eurasia’s buzzwords, a principle to be invoked at multilateral fora like the Shanghai Cooperation Organization or when a red line has been crossed. Its invocation is never a good sign. What’s worse is that, according to Rosneft’s own communications director, companies have been exploring the block in question for 16 years without such complaints from Beijing. There are plenty of other obstacles in the way of Russia’s attempts to broaden and deepen its economic and security relationships across the Asia-Pacific. It appears China is ready to begin explicitly bending Moscow’s options to its will, despite the allure of claiming good relations to scare the West. Igor Sechin probably thought he’d lined up victory after victory for Putin and Russia by feeding China’s growing oil hunger. It looks like he may have dug a policy hole instead. Nicholas Trickett holds an M.A. in Eurasian studies through the European University at St. Petersburg with a focus on energy security and Russian foreign policy. He is a columnist and senior editor for the Foreign Policy Research Institute’s Bear Market Brief, acting Editor-in Chief for Global Risk Insights, and contributes to other outlets like Oilprice and Aspenia.